You are currently browsing the archive for the December 2017 category. It was on this day, December 30th, in 1856, that the Rev. 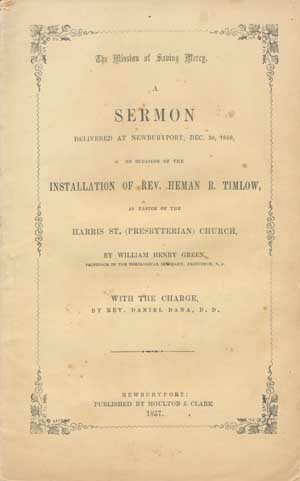 Dr. William Henry Green brought a sermon on the occasion of the installation of Rev. 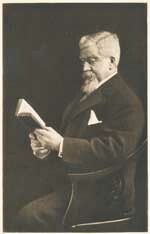 Heman R. Timlow, as pastor of the Harris Street Presbyterian Church, Newburyport, Massachusetts. Rev. Timlow had been called to serve this church following the resignation of the Rev. W.W. Eels in March the year prior. All of which is admittedly a rather obscure set of facts and we might honestly wonder why it should merit our attention? Among Presbyterians, the installation of a pastor remains to this day a service carried out in much the same way. So for one, if we were to look for a model for such an occasion, then here is one example. 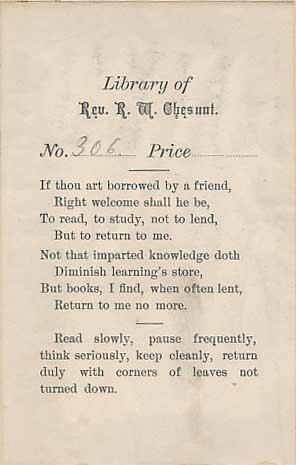 Moreover, we have here a sermon by an admittedly brilliant young man, at a point early in his remarkable career. There is also the contrast of the youth of Dr. Green [1825-1900], just 31 years old when he served at the installation of this new pastor, compared with the advanced age of Rev. Dana, then near the end of his life yet still faithfully serving the Lord’s people at this installation. Dr. Green came from a long line of Presbyterians, among them, Jonathan Dickinson, first president of the College of New Jersey (later Princeton University). Green had graduated from Princeton Seminary in 1846, was ordained in 1848, and following a brief pastorate in Philadelphia, was installed in 1851 as professor of Biblical and Oriental Literature at the Princeton Theological Seminary. He remained a professor there until his death in 1900. Rev. Daniel Dana [1771-1859] as noted was near the end of his life, having long served the Presbyterian churches of Newburyport. It was Rev. Dana who had asked Dr. Green to bring the installation sermon on this occasion. Rev. Dana then brought the charge to the pastor. Others serving at this installation included the Rev. John Pike, of Rowley, who brought the charge to the people; and the Rev. A.G. Vermilye, of Newburyport, who extended the right hand of fellowship. By the standards of that era, Green’s message is rather brief, taking up just 12-1/2 pages in print. 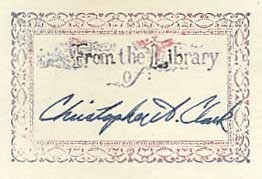 Many of his peers would typically produce similar sermons of twenty pages or more. But length is no judge of quality, and Green is succinct for a purpose, and from a pastoral standpoint, could be seen as a hallmark of his long career at Princeton Seminary, indicative of the heart of his ministry. 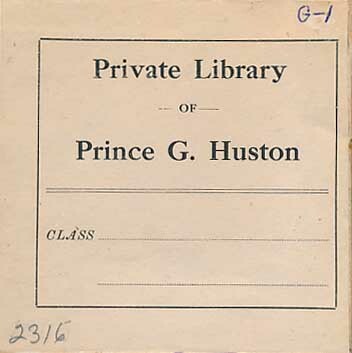 A print copy of the above sermon may be found preserved at the PCA Historical Center. Or more conveniently, it may be found on the Web by clicking here. Never lend books, for no one ever returns them; the only books I have in my library are books that other people have lent me. 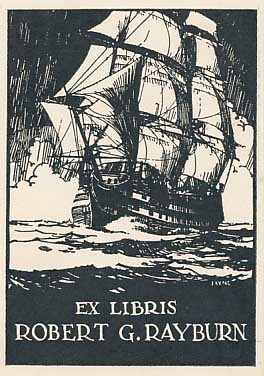 Bookplates affixed inside a volume of the works of Jonathan Edwards. Rev. 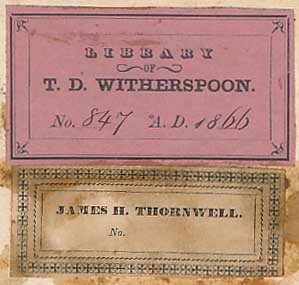 Thomas Dwight Witherspoon, whose papers are preserved at the PCA Historical Center. founding pastor of several churches in New Mexico. The new year does indeed face us. How will we use the time God gives us? Have we used this soon-past year for His glory? More than any plans for the future—for plans are so subject to change—are we living each day on our knees, in prayer before the throne of glory? Have we established a habit of committing each day to the Lord, seeking to do His will? Put the Lord first in all things, and He will bless your days. So teach us to number our days, that we may apply our hearts unto wisdom.—Psalm 90:12, KJV. Some time back I remember someone asking whether Machen’s father was in fact a Christian. Later, while working through our collection of pamphlets by Dr. J. Gresham Machen, I came across an offprint titled CHRISTIANITY IN CONFLICT (1932), and noted the following remembrances that Machen offers regarding his father. My father was a lawyer, whose practice had been one of the best in the State of Maryland. But the success which he attained at the bar did not serve in the slightest to make him narrow in his interests. All his life he was a tremendous reader, and reading to him was never a task. I suppose it never occurred to him to read merely from a sense of duty; he read because he loved to read. He would probably have been greatly amused if anyone had called him a “scholar”; yet his knowledge of Latin and Greek and English and French literature (to say nothing of Italian, which he took up for the fun of it when he was well over eighty and was thus in a period of life which in other men might be regarded as old age) would put our professional scholars to shame. With his knowledge of literature there went a keen appreciation of beauty in other fields—an appreciation which both my brothers have inherited. One of my father’s most marked characteristics was his desire to have contact with the very best. The second-best always left him dissatisfied; and so the editions of the English classics, for example, that found place in his library were always carefully chosen. 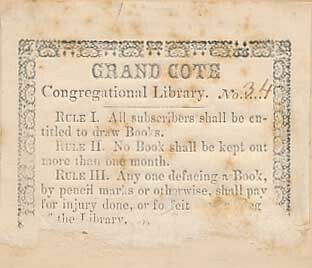 As I think of them, I am filled with renewed dismay by that provision of the Vestal Copyright Bill, nearly made a law in the last Congress, which would erect a Chinese wall of exclusion around our country and prevent our citizens from having contact with many things that are finest and most beautiful in the art of the printing and binding of books. 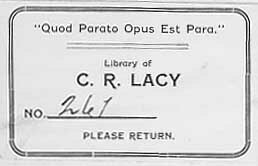 My father’s special “hobby” was the study and collection of early editions—particularly fifteenth-century editions of the Greek and Latin classics. 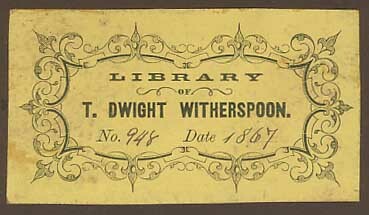 Some fine old books were handed down to him from his father’s home in Virginia, but others he acquired in the latter part of his long life. 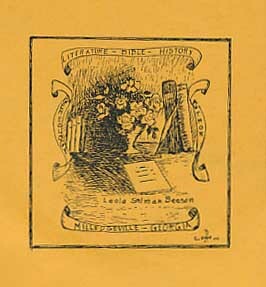 His modest means did not suffice, of course, for wholesale acquisitions, but he did try to pick up here and there really good examples of the work of the famous early printers. He was little interested in imperfect copies; everything that he secured was certain to be the very best. I can hardly think of his love of old books as a “hobby”; it was so utterly spontaneous and devoid of self-consciousness. 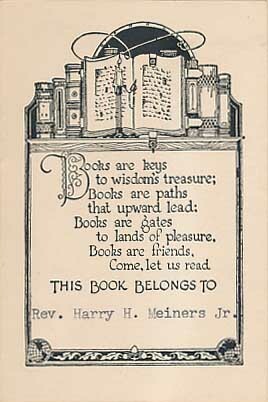 He loved the beautiful form of the old books, as he loved their contents; and the acquisition of every book on his shelves was a true expression of that love. He was a profoundly Christian man, who had read widely and meditated earnestly upon the really great things of our holy Faith. His Christian experience was not of the emotional or pietistical type, but was a quiet stream whose waters ran deep. He did not adopt that “Touch not, taste not, handle not” attitude toward the good things or the wonders of God’s world which too often today cause earnest Christian people to consecrate to God only an impoverished man, but in his case true learning and true piety went hand in hand. Every Sunday morning and Sunday night, and on Wednesday night, he was in his place in Church, and a similar faithfulness characterized all his service as an elder in the Presbyterian Church. Born in Ireland in 1723, Robert Smith accompanied his parents to America in 1730. He was of the stock of Scots who had moved from Scotland to Ireland and then on to America. Upon arrival in this new land, the family settled about forty miles from Philadelphia along the Brandywine River. At age 15, Robert was one of the countless converts of the Spirit under the gospel preaching of George Whitefield in his first tour to America. Shortly afterwards, Robert Smith felt the call of that same Spirit to enter the ministry. His parents supported him in this divine call and encouraged him to enter the church academy of Faggs Manor Presbyterian Church in Pennsylvania under the tutelage of its pastor, the Rev. Samuel Blair. This school trained him in theological and pastoral subjects, all of which he did well, quickly acquiring the subjects. It was not surprising then that Robert Smith sought licensure by the Presbytery of Newcastle, New Side, which was successful on this day, December 27, 1749. Less than a year later, after practical work in churches to test his call, he accepted a double call, upon ordination, to the Presbyterian congregations at Pequea and Leacock, Pennsylvania, for which he was to stay, at least in Pequea, for the next forty two years. What is important for us today is that Pastor Robert Smith began an academy there which was instrumental in educating countless Presbyterian ministers of Pennsylvania and surrounding states. This was before Princeton Theological Seminary was begun in 1812, so its very existence filled the empty pulpits of Presbyterian meeting houses all over the then-known land. And it was no easy school to attend either. The language of choice was Latin, and speaking in class either to the teachers or one another in any other languages was punishable as a fault. Yes, Hebrew and Greek were also studied, and theological and Biblical books were included in the course work. 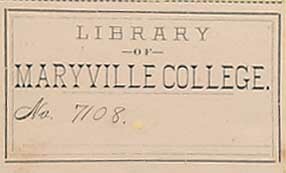 Thus, the academy was preparatory to the College of New Jersey as well as preparatory for work in the pastorate. As many as fifty ministers received part of their education here as well as others who went into other callings in life. It continued for forty years and was one of the forerunners to Princeton Theological Seminary. The churches of Pennsylvania and surrounding states required an earnest ministry. It was impossible to look abroad for its teaching elders. Further, the cost of travel to the centers of education in New England was too great for the infant church. A school for ministry in their own back yard, so to speak, was the only answer. And God’s Spirit answered that call by raising up the Academy at Pequea, Pennsylvania. Modern churches today face a different challenge, in that some of our future pastors are older in age when their call to ministry comes from the Holy Spirit. Often married with families, future pastors cannot leave established jobs and go to seminaries to study the three or four years required for graduation. This is where local Presbyterian churches can come to the fore. Covenant Theological Seminary has any number of seminary courses on line which can be inserted into a Sunday School curriculum or special classes during the church week for preparatory work in training. Those local ministries can then offer opportunities for service under the oversight of teaching and/or ruling elders in the local church. Local Presbyteries can take such students under care as they prepare for God’s work. As Jesus put it in Matthew 9:37, 38 “The harvest is plentiful, but the workers are few. Therefore beseech the Lord of the harvest to send out laborers into His harvest.” (NASB) Are you asking the Lord of the harvest for a plentiful supply of workers in His kingdom? Pray today, and regularly, for that spiritual need. The situation was bleak. Barely into the American Revolution in the colonies, British forces in the future United States of America were winning everywhere. If something could be done even by a small military victory, it might revolutionize the American people to continue on to win their independence. That need was supplied by the military victory at Trenton, New Jersey on December 26 1776. Reeling from their defeat on Long Island, New York, General George Washington realized the need for a victory over the British Forces. Choosing the 900 member Hessian mercenary force in Trenton, New Jersey might be the answer. But to march in frozen conditions was a challenge to a hungry and decimated army. At best, Washington could summon somewhere around 2400 soldiers. And there was a “little” matter of a Delaware River in winter to cross to get to the German encampment. For that reason, Washington instructed that “two good guides” be furnished with each brigade, to guide them to their target. Among those “good guides” were three privates in the colonial militia of the area, all members of the Presbyterian Church of Pennington, New Jersey. Their names were David Laning, John Guild, and John Muirhead. All three were commanded by Gen Washington to dress in civilian clothes for their important mission and ride ahead of the American forces. David Laning had actually been captured by the British forces several days before the intended mission and put under guard in Trenton. He took advantage of a distraction by his German guard and made his escape to the house of a friend. The next day, disguised as an elderly wood cutter, he was able to cross the Delaware River again and rejoin his fellow Presbyterian members back in camp. We have all seen the famous painting of George Washington crossing the Delaware on his way to Trenton. Each year, it is a scene which is recreated by American citizens in the area. On that night, we know the story of complete surprise to the celebrating Hessian troops, some 900 of whom were captured by the victorious American patriots. Actually, it was David Laning the Presbyterian guide who signaled the attack to take place. And the rest is history, as they say. The small victory brightened the horizon of the colonists. The next battle fought was that of Princeton, New Jersey, which was also a victory of the American revolutionaries. The tide was beginning to turn. Time and time again in these posts of Presbyterian History, we have seen faithful and courageous Presbyterian men and women take their place in important missions for God and country. Don’t think, Presbyterian reader, that all such opportunities for service are only in the past. Look around in your area and see with the eyes of faith, opportunities to glorify God and serve Him in church and state. Then, give of yourself, your gifts, and talents, to be that one to “stand in the gap” for Christ. One last post drawn from THE NEW YORK OBSERVER, for now. The church is, of course, the people and not the building. Still, it is interesting how place comes to hold the memories and emotions that sum up the years. The days had woven themselves into months, and the months had grown silently into years, since I had entered the dear old church. And now my tired feet were turning thitherward once more. Ah, me! that it should be so, but I fear those feet have wandered far from the narrow way they had entered, in the long ago, beneath these sacred walls. Along the dusty highway of life, over its high mountains of danger and temptation, from whose summit I had caught visions of far off, fair Beulah; down into its deep valleys of sordid care and strife, into whose gloom no glimmer, even, of the heavenly brightness had ever entered, to the sound of funeral dirges, and of wedding marches, these weary feet have toiled, until at last they have come again to these sacred portals. It is not a beautiful church; indeed, I believe people generally call it a very ugly one. But to me, the deep, low galleries, the tall, massive pillars, with the vast open dome brooding over all, are beautiful, for they are draped about with the prayers of the saluted dead, and the sweet peace of the “first love,” lingers like incense in the shadows. Even as I enter the narrow doors, the deep joy of the olden time, the trustful early love that was content to lay all things at the Father’s feet, and leaning on His bosom, wait calmly for the future, came stealing to my heart again. Then came the touch of the baptismal waters, and the words, “I baptize thee in the name of the Father, and of the Son, and of the Holy Ghost. Amen.” And I stood in the presence of that crowd of seen and unseen witnesses, with His vows upon me. He only knows how sadly those baptismal robes have been stained, how often those vows have been broken. Oh! it is to the weary wanderer like coming home again; home to sweet, sacred memories; home to loving hearts and warm welcome words. They are nearly all here that I used to meet on those olden Sabbaths; truly there are some vacant places, but they are not many; the children are a little older grown, and perhaps there are a few more wrinkles and silver hairs, marking the fathers and mothers, but they are nearly all the same, and the loving words and warm hand-pressures are the same they gave to the youthful pilgrim. God bless them. It is peace and rest, after all the conflict, just to sit quietly here, in the old place, and with closed eyes drink in the sweet peace and joy of past and present pardon. To listen with a full heart to the well-known, well-loved voice that speaks from the square old pulpit, just the text my wayward heart needed: “Delight thyself in the Lord, and He shall give thee the desires of thine heart. Commit thy way unto the Lord; trust also in Him, and He shall bring it to pass.” Yes, that was the God-sent message, to trust Him. In the past I had, indeed, commited my ways unto the Lord, but I had not trusted Him; and ever since I have been trying to shape them out myself. To-day, please God, I’ll learn the double lesson: “Commit thy way unto the Lord, trust also in Him.” And perchance, in all the after-journey, whether I stand upon the mountain-top or go down into the valley, alike to both will come visions of fair Beulah, and back to heart and life shall come the early love and holy influences of this old church, to grow and broaden, till by God’s grace I stand within the golden portals of the heavenly temple. THE NEW YORK OBSERVER, 48.33 (18 August 1870): 257, column 5. Another short piece from THE NEW YORK OBSERVER. The lesson needs no elaboration. The reader will please be patient with the attempted dialect. 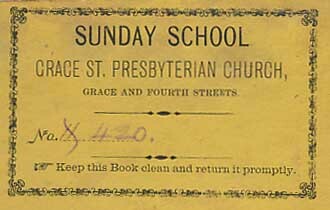 A hundred years ago and more, a numerous body of Presbyterians who had seceded from the Established Church of Scotland, was split in two on a quarrel about a clause in the oath required of the freemen of certain Scottish boroughs, which expressed “their hearty allowance of the true religion at present professed within the realm, and authorized by the laws thereof.” The party who held that the oath might be conscientiously taken by seceders were called “Burghers,” and their opponents “Anti-burghers.” Johnny Morton, a keen Burgher, and Andrew Gebbie, a decided Anti-burgher, both lived in the same house, but at opposite ends, and it was the bargain that each should keep his own side of the house well thatched. 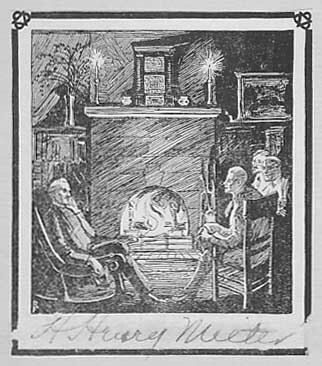 When the dispute about the principle of their kirks, and especially the offensive clause in the oath, grew hot, the two neighbors ceased to speak to each other. But one day they happened to be on the roof at the same time, each repairing the thatch in the slope of the roof on his own side, and when they had worked up to the top, there they were—face to face. They could’nt flee, so at last Andrew took off his cap, and scratching his head, said, “Johnnie, you and me, I think, hae been very foolish to dispute, as we hae done, concerning Christ’s will about our kirks, until we hae clean forgot His will aboot ourselves; and so we hae fought sae bitterly for what we ca’ the truth, that it has ended in spite. Whatever’s wrang, it’s perfectly certain that it never can be right to be uncivil, unneighborly, unkind, in fae, tae hate ane anither. Na, na, that’s the deevil’s wark, and no God’s. Noo, it strikes me that maybe it’s wi’ the kirk as wi’ this house; ye’re working on ae side and me on the t’ither, but if we only do our work weel, we will meet at the tap at last. Gie’s your han,’ auld neighbor!” And so they shook han,’ and were the best o’ freens ever after. The New York Observer, 44.2 (11 January 1866), page 12, column 3, below the fold.